I hosted a Tarot Party at my place yesterday, and I had a raffle for an Annual Tarot Reading PLUS a 60-minute Tarot session with me. Tickets were $1 each or 6 for $5. 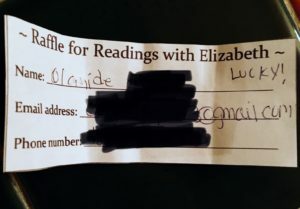 My kid’s friend, Olamide, entered the raffle with one ticket. He wrote “Lucky!” in the right corner and told my daughter Aspen that he was going to win. At the end of the evening, I put the lid on the raffle tickets and shook the plastic jug. Aspen then swirled all the tickets around. I put my hand in, and pulled out a ticket from the middle. It was Olamide’s “Lucky!” ticket. There were only around 60 tickets in the bucket, so his chances were good, and yet some people are simply good at manifesting things in their life. According to my daughters, their friend is one of them. He held the vision, put it out to the universe through his word (both spoken and written), and then just sat back expecting the results. The most key component to manifesting is simply KNOWING you’ve already got what it is you’re trying to manifest. You believe it, and you expect it. Now, you won’t always win when you write “Lucky!” on a raffle ticket, but your odds will be greatly increased for winning when you KNOW you’re a winner. intention, intention setting, intentions, law of attraction, manifest, manifest desires, manifest dreams, manifest happiness, manifest wishes, manifestation, manifesting. Bookmark.